Warning: You must ensure you meet all age and other regulatory requirements before entering a Casino or placing a wager online. There are hundreds of jurisdictions in the world with Internet access and thousands of games and gambling opportunities available on the Internet. 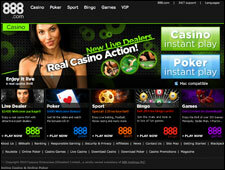 You are responsible for determining if it is legal for you to play any particular games or place any particular wager. PlayersJet tries to provide complete, accurate, and current information. If you should observe any incomplete or inaccurate information, we would appreciate being notified. PlayersJet assumes no legal responsibility for errors or omissions in these materials. THESE MATERIALS ARE PROVIDED "AS IS" WITHOUT WARRANTY OF ANY KIND, EITHER EXPRESS OR IMPLIED, INCLUDING BUT NOT LIMITED TO, THE IMPLIED WARRANTIES OF MERCHANTABILITY, FITNESS FOR A PARTICULAR PURPOSE, OR NON-INFRINGEMENT. PlayersJet further does not warrant the accuracy or completeness of the information, text, graphics, links or other items contained within these materials. PlayersJet shall not be liable for any special, indirect, incidental, or consequential damages, including without limitation, lost revenues or lost profits, which may result from the use of these materials. The information on this server is subject to change without notice and does not represent a commitment on the part of PlayersJet in the future. ©Copyright 2005 PlayersJet, Inc. or its affiliates. All rights reserved. All trademarks mentioned herein belong to their respective owners. Unless identified with the designation "Copy Freely", the contents of this Web site are copyrighted by PlayersJet. PlayersJet hereby authorizes you to copy documents published by PlayersJet on the World Wide Web for non-commercial use within your organization only. In consideration of this authorization, you agree that any copy of these documents you make shall retain all copyright and other proprietary notices contained herein. You may not otherwise copy or transmit the contents of this Web site either electronically or in hard copies. You may not alter the content of this Web site in any manner. If you are interested in using the contents of this Web site in any manner except as described above, please contact us for information on licensing. Individual documents published by PlayersJet on the World Wide Web may contain other proprietary notices and copyright information specific to that individual document. Nothing contained herein shall be construed as conferring by implication, estoppel or otherwise any license or right under any patent, trademark or other property right PlayersJet or any third party. Except as expressly provided above nothing contained herein shall be construed as conferring any license or right under any copyright or other property right of PlayersJet or any third party. Note that any product, process, or technology in this document may be the subject of other intellectual property rights reserved by PlayersJet and may not be licensed hereunder.